Love is the incredible psychic adhesive that glues us all together. It is complex and vast in its mystical workings, and for the life of me, one of the hardest emotions to piece together as a painting. When doing the “Human Condition Series”, emotions of greed, despair, and confusion were the easiest to put together, as these primarily worked as surface agents that, from a visual perspective, were easy to explain. Love, in all its circuitous glory, was far more intimidating to create, as it relied on my understanding on emotional depth, .. and I had to dive deep into the random crazy scribblings that I prescribe myself in these workings to fundamentally explain the sinewy fabrications of an emotion I have chased for years. This piece is composed of dozens of phrases that ultimately construct the cloud 9 consciousness that love emits. In the face, items of music, flowers, and catchphrases bloom from the center of the face. 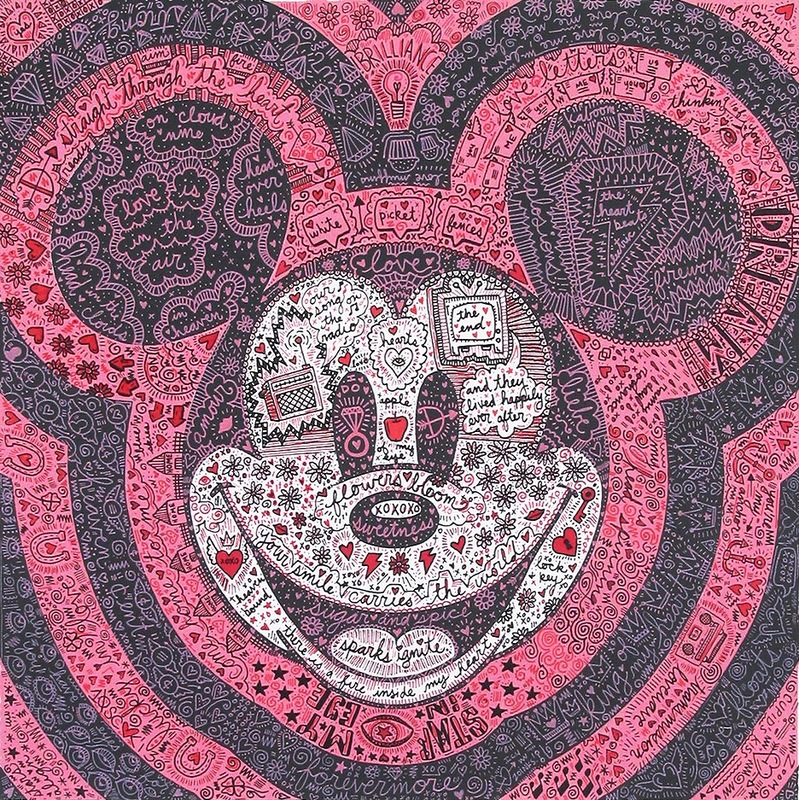 There are radiating circumferences of pink and black that pulsate to the outer edges of the piece, signifying that frequency like signal that the feeling of love emits… almost as if Mickey is radio tower broadcasting waves of joy and happiness to all that is in reach. This started out in Seattle Washington at a wedding on Capitol Hill during Valentines Day, and was worked on a flight back to San Francisco, and various diners and locations all over SF as well. This piece is entitled “Forevermore” as in reference to happily ever after we, as humans, chase throughout our lives. It is the 8th in “Human Condition” series, and 58th in the TENxTENxTEN collection.